Several factors are working in favour of farmers at present, particularly those in the sheep and beef sector. Processors are paying $8 per kilogram for lambs, the beef schedule has remained firm for months, foreign exchange is tipping in favour of primary producers, and interest rates are holding fast at all time lows. These are positive trends. In horticulture, the news is also rosy, with plenty of development in many regions as growers and investors take advantage of buoyant demand from eager export markets. Orchards, vineyards and development blocks for grapes, kiwifruit, avocados, pipfruit and stonefruit, in regions including Bay of Plenty, Hawke’s Bay, Marlborough and Central Otago are selling at record levels. Markets in these sectors are only hindered by the lack of land available to buy or develop. Although the dairy payout is less encouraging than where it was a few months ago, it is still high enough to suggest dairy farmers are in for a reasonable season. Pastoral farms selling towards the end of last season at values approaching benchmark levels, livestock sales, the appetite for pastoral improvement and evidence of other types of on-farm investment all point to a high degree of farmer confidence. In rural property, sheep and beef farms look set to feature strongly this spring and summer. Record returns and high confidence levels are reflected in the demand for breeding and finishing farms in most regions. This sector is definitely a seller’s market. Anyone offering a sheep and beef farm for spring sale can expect a satisfactory result. 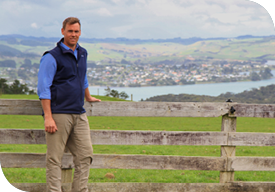 As you will see in this edition of PGG Wrightson Real Estate’s flagship publication Property Express, some exceptional sheep and beef farms are for sale. Active buyers are primed to seize on these properties and it is safe to assume that sales will eventuate at or approaching record levels. Cyclical issues around farm ownership and career progression are motivating those who seek to sell. Many older farmers, who may have been contemplating down-sizing for several years, will recognise this as an opportune time to go to the market. In this generation, increasingly complex compliance requirements can be an added incentive to pass on the farm to a new owner. That said, wet weather particularly in the North Island, means several farms that would otherwise have come onto the market in early spring will now not be listed for sale for another few weeks. In other cases, the high returns on offer for red meat may motivate farmers to capitalise on the income stream for one more propitious season, and hold off on selling land now, rather than taking advantage of the enthusiasm of the rural property market. Farmers may be tempted to cash in on a favourable market for their produce, particularly if this is the high point for their generation. Whether that is the wisest decision in the long run, and risks subsequently going to the property market in competition with a higher number of future listings, remains to be seen. Therefore, while the spring rural property market seems to be set fair for some positive activity over the coming months, this needs to be proven with actual sales. In the event, the early spring selling season may be pushed out, and buyers and sellers may not properly come together until November or December. Willing buyers are seeking property in most farm types, which looks unlikely to change through the rest of the year. Although the supply of desirable farms should increase, it will not exceed demand and values should therefore hold firm. To evaluate your options to buy or sell rural property, contact a PGG Wrightson Real Estate salesperson at a local office near you. We cover the country with a broad team, encompassing deep experience and decades of local knowledge, linked to an unsurpassed network fully attuned to those who do business on the land. We look forward to providing independent advice to assist you to achieve your rural property objectives.